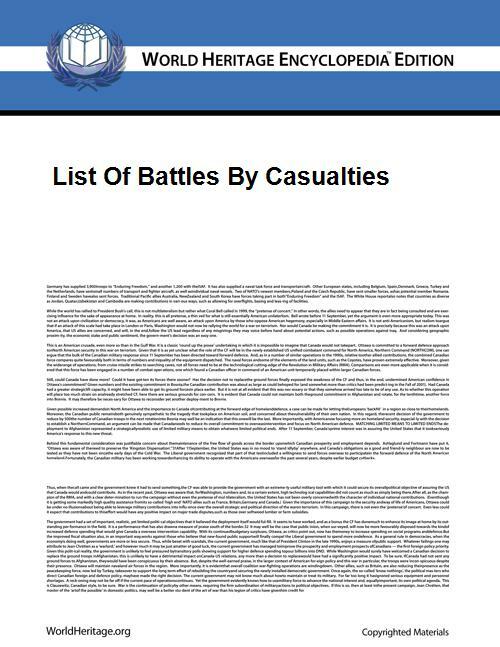 The following is a list of the casualty count in battles in world history. The list includes both sieges (not technically battles but usually yielding similar combat-related deaths) and civilian casualties during the battles. Large battle casualty counts are almost impossible to calculate precisely. Many of these figures are estimates, and, where possible, a range of estimates is presented. Figures display numbers of all types of casualties when available (killed, wounded, missing, and sick) but may only include number killed. Where possible, the list specifies whether or not prisoners are included in the count. This list does not include bombing runs or missile strikes (such as the attack on Pearl Harbor and atomic bombings of Hiroshima and Nagasaki), which, despite potentially massive casualties, are not typically classified as "battles," since they are usually one-sided engagements or the nation attacked upon is not officially at war with the attackers. Tactical or strategic strikes, however, may form part of larger engagements which are themselves battles. This list includes sieges, as well as modern battles that were fought primarily in urban areas. Major military operations that included city fighting are listed below. Sieges and urban combat often include heavy civilian casualties, which are included in this list. This list is sortable. Click the box next to a column heading to sort by that criterion. This list includes major operations and prolonged battles or operations fought over a large area or for a long time. The duration of some operations, like the Battle of Moscow, are disputed so numbers found in various sources may differ for that reason alone. These refer to battles in which armies met on a single field of battle and fought each other for anywhere from one to several days. With more advanced weapons, military formations lost their impact and use of this type of battle died out in favor of grander military operations. Many of these battles are ancient, and in several cases, the few extant historical records differ, sometimes wildly, on casualties. Entries here use modern figures when available. This list is sortable. Click a column heading to sort by that criterion. ^ "Artaxerxes III Ochus (358 BCE to 338 BCE)". Retrieved 2 March 2008. ^ Antiochus Strategos, "The Capture of Jerusalem by the Persians in 614 AD", F. C. Conybeare, English Historical Review 25 (1910) pp. 502–517. ^ Saunders, J.J. 2001. The History of the Mongol Conquests. Philadelphia: University of Pennsylvania Press. ^ Arnold Cassola, The 1565 Ottoman Malta Campaign Register, (Publishers Enterprise Group: Malta, 1998), p. 111. ^ Firoozi, Edith, and Ira N. Klein. Universal History of the World: The Age of Great Kings. Vol. 9. New York: Golden Press, 1966. pp. 738–739. ^ "忻口会战_互动百科". www.hudong.com. Retrieved 2015-11-02. ^ "Second Battle of Shanghai". WW2DB. Retrieved 2015-10-24. ^ Bob Tadashi Wakabayashi, ed. (2008). The Nanking Atrocity, 1937-38: Complicating the Picture. Berghahn Books. p. 362. ISBN 1845451805. ^ "Battle of Wuhan". WW2DB. Retrieved 2015-10-24. ^ "First Battle of Changsha". WW2DB. Retrieved 2015-11-02. ^ "Battle of Nanchang". WW2DB. Retrieved 2015-11-02. ^ Hsiung, James. China's Bitter Victory: The War with Japan, 1937-1945. p. 158. ^ Chang, Jung; Halliday, Jon. 2006. Mao: The Unknown Story. London: Vintage Books. p383. ^ ANDREW JACOBS (2009-10-02). "China Is Wordless on Traumas of Communists' Rise". New York Times. Retrieved 2012-07-10. ^ Dauria, Tom. Within a Presumption of Godlessness. ^ "From Sarajevo to Hollywood: Life under siege". The Independent (London). 1 September 2008. Retrieved 27 March 2010. ^ Garber, John. Chinese-Soviet Relations, 1937–1945. p. 120. ^ "Zhejiang-Jiangxi Campaign". WW2DB. Retrieved 2015-11-02. ^ Mart Laar (2006). Sinimäed 1944: II maailmasõja lahingud Kirde-Eestis (Sinimäed Hills 1944: Battles of World War II in Northeast Estonia) (in Estonian). Tallinn: Varrak. ^ Pike, Francis (2015-06-18). Hirohito's War: The Pacific War, 1941-1945. Bloomsbury Publishing. ^ McLynn. The Burma Campaign: Disaster into Triumph, 1942–1945. p. 1. ^ a b Herodotus (440 BC). Histories. ^ Ashoka the Great (r. 272–231 BC), Edicts of Ashoka, Major Rock Edict 13. ^ Radhakumud Mookerji (1988). Chandragupta Maurya and His Times. Motilal Banarsidass Publ. ISBN 81-208-0405-8. ^ Leonard Cottrell (1965). Enemy of Rome. Evans Bros. ISBN 0-237-44320-1. ^ Valerius Antias (1st century BC). Manubiae. ^ Albert A. Howard (1906). "Valerius Antias and Livy", Harvard Studies in Classical Philology 17, p. 161–182. ^ Canon Rawlinson (1877). "On the Ethnography of the Cimbri", The Journal of the Anthropological Institute of Great Britain and Ireland 6, p. 150–158. ^ Wells, Peter S. The Battle that stopped Rome. New York: W.W. Norton & Company. 2003, p. 187. ISBN 0-393-32643-8. ^ Book of Sui, Vol. 60. ^ The Muqaddimah: An Introduction to History By Ibn Khaldūn, Franz Rosenthal, N. J.. Dawood pg, 12. ^ "The Sword of Allah", Chapter 22, by Lieutenant-General Agha Ibrahim Akram, Nat. Publishing. House, Rawalpindi (1970) ISBN 978-0-7101-0104-4. ^ A. I. Akram (1970). The Sword of Allah: Khalid bin al-Waleed, His Life and Campaigns. National Publishing House, Rawalpindi. ISBN 0-7101-0104-X. ^ Jackson, Peter (2005). The Mongols and the West, 1221–1410. Pearson Education Limited. ^ B.F. Manz, "Tīmūr Lang", in Encyclopaedia of Islam. ^ Volume III: To the Year A.D. 1398, Chapter: XVIII. Malfúzát-i Tímúrí, or Túzak-i Tímúrí: The Autobiography or Memoirs of Emperor Tímúr (Taimur the lame). Page 389. 1. Online copy, 2. Online copy from: Elliot, Sir H. M., Edited by Dowson, John. The History of India, as Told by Its Own Historians. The Muhammadan Period; published by London Trubner Company 1867–1877. ^ Turnbull, Stephen; Samurai Invasion: Japan's Korean War 1592–98. London: Cassell & Co, 2002, p.148. ^ Tucker, Spencer (2010). Battles That Changed History: An Encyclopedia of World Conflict. ABC-CLIO. p. 216. ^ NOD, pp 1-5 Prof AWG Raath (2013). Brewer, Paul (2007). The Chronicle of War: A Year-by-Year Account of Conflict from 1854 to the Present Day. London: Carlton Books. Grant, R. G. (2005). Battle: A Visual Journey Through 5,000 Years of Combat. Dorling Kindersley. Hassig, Ross (1994). Mexico and the Spanish Conquest. New York: Longman. Mann, Charles (2005). 1491: New Revelations of the Americas Before Columbus. New York: Vintage Books. Tucker, Spencer, ed. (2005). Encyclopedia of World War I 4. ABC-CLIO. Alistair Horne. (1977). A Savage War of Peace: Algeria 1954–1962. James Grant Duff. (2001). A history of the Mahrattas (3 volumes). Yokai Publishing. H.R.G Rawlinson. (2006). An account of the last battle of Panipat, and the events leading to it. Hesperides Publishing. Hall, Richard C. (2000). The Balkan Wars, 1912–1913: Prelude to the First World War. Routledge.